Keurig K55 Review: Better Than a Coffee Shop or a Waste of Money? Coffee Geek Lab / Keurig K55 Review: Better Than a Coffee Shop or a Waste of Money? These days, you don’t have to go to your local coffee shop when you want to enjoy a delicious, freshly-brewed beverage. In fact, you can become your own barista without an effort. How? By simply using a capsule coffee machine. In this Keurig K55 review, we will see how this machine performs and whether it’s worth your money. Available cup sizes: 6 oz., 8 oz., and 10 oz. Water reservoir capacity: 48 oz. Every coffee machine needs to be cleaned regularly, and the Keurig K55 is not an exception. You see, there can be a buildup of coffee oils and residue, which can make your beverages taste burnt or bitter, or just weird. So, if you want your coffee to always be delicious, cleaning your machine regularly is a necessity. Design doesn’t only mean how a machine looks. The most important is how it is made and how it operates. So, let’s take a closer look at how the K55 is designed. Simple button controls, transparent water reservoir, and plain colors. This machine has a plastic exterior, which might seem rather cheap to some users. There are no luxurious metallic parts, so the K55 looks very simplistic. I personally don’t find it to be a huge drawback, especially for such a price. If you want your coffee maker to have something extra in its appearance, you probably need a more luxurious model. The K55 is more on the larger side. It’s not the bulkiest coffee machine that I’ve tried, but it’s definitely not a mini model either. So, if you have a very limited kitchen space, consider the machine’s dimensions before making a purchase. 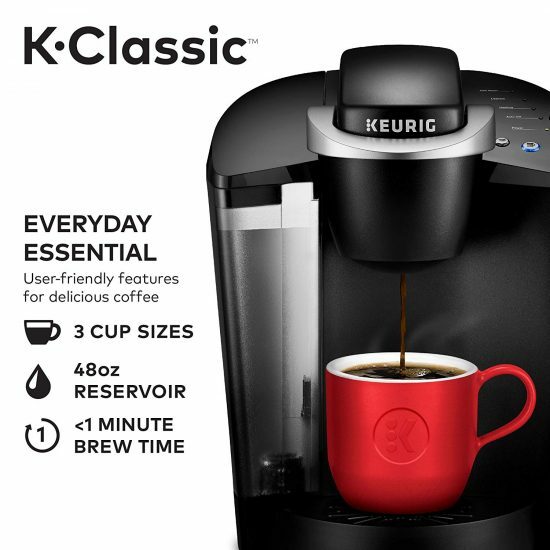 The Keurig K55 was designed to offer the simplest operation possible. It has an easy-to-use handle, which closes the coffee capsule compartment. This machine works with button controls, so you’ll get your coffee without an effort. One of the cool things about the Keurig K55 is that it accommodates larger cups and travel mugs. So, if you are late for work, for example, and want to drink your morning coffee on the go, you can brew it directly into your travel mug without wasting those precious minutes. 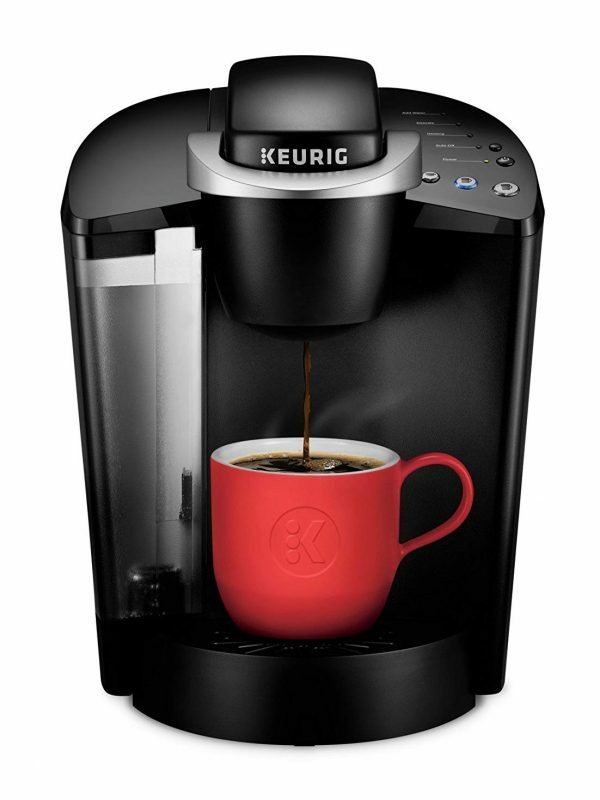 The Keurig K55 is a machine that combines all the necessities for a fresh cup of coffee. It is user-friendly and easy to control. Additionally, it’s fast and offers some versatility in use. 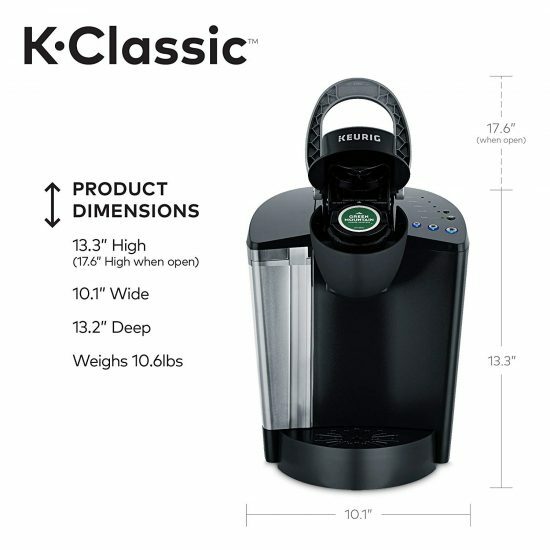 First of all, with the K55, you can brew 3 different cup sizes: 6, 8, and 10 oz. This model also has a removable drip tray, which means it can accommodate taller cups and even travel mugs. It does not allow users to pick the “Strong” brew option, however, which can be a disappointment for some coffee lovers. Additionally, this model doesn’t have a carafe function, which means you can brew one cup at a time. The good news is, with the K55, you can explore the world of capsule coffee. This machine supports dozens of different K-cup pods from various brands. You can try multiple coffee flavors or even brew hot chocolate and tea (as long as they come in a form of a K-cup). The K55 takes very little time to heat up and brew coffee. The first cup usually takes a couple of minutes (3-4) since it requires the machine to heat the water up (to around 193-197 F). However, each next cup takes less than a minute to brew. After all, we buy coffee machines because we want our home-brewed beverages to be coffee shop quality, right? Now, the K55 can brew a good cup of coffee, that’s for sure. 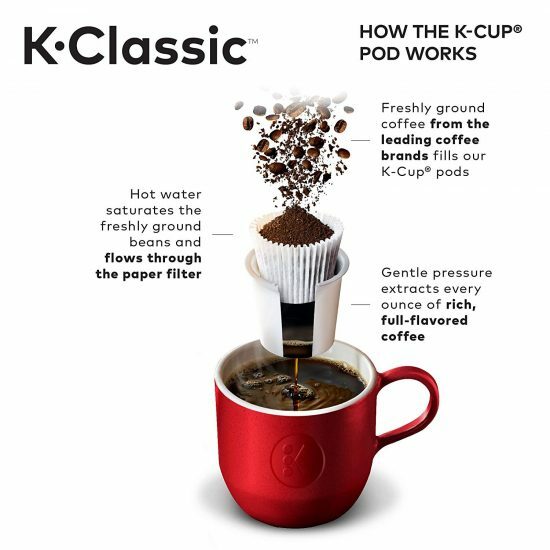 Of course, each beverage will depend on the K-cup type and flavor that you’re using. However, overall, this model delivers more than just a decent flavor. It makes delicious coffee. Keep in mind that it’s not too strong, so if you are a true fan of espresso, you should not get yourself a capsule machine. But if you simply want a hot, delicious coffee beverage, the K55 will suffice. If you want the best quality coffee, you should avoid using tap water. Bottled or filtered water is a better option. It results in a purer flavor and can even protect your machine from the scale buildup. As you already know, this model has a plastic exterior. And, to be honest, it doesn’t look that durable. Of course, for such a price, a fully plastic facade is not a surprise, at least to me. But don’t think that this coffee maker will fall apart after the first use. This model feels quite sturdy. The plastic isn’t too thick, but it seems reliable. Some occasional creaking is possible, but I haven’t experienced any other issues with this machine. I was using the K55 as my main coffee maker, every day, multiple times a day. It didn’t break down, thankfully, so I feel like this simple machine can easily handle regular use. Most importantly, its internal components are of better quality than its exterior. I am sure that if you descale your K55 regularly, you won’t have any problems with its performance and durability. However, plastic is still plastic, so my advice is: try to be gentle with your machine. It will serve you for a long time, especially if you take good care of it. Fill the water reservoir with a special descaling solution (which you can find online or at local supermarkets). If you can’t find it and need a substitute, use white vinegar mixed with water (1:1 ratio). Place a large mug or a container on the dripping tray. It will catch the solution once the cleaning cycle is over. Press the brew button (pick the biggest cup size). Repeat the process a couple of times for the most effective cleaning. Let the brewer cool down. 30-40 minutes should be enough. Run a couple of cycles using clean water and no coffee capsules. This will rinse the cleaning solution (or vinegar) out from the system. And there you have it! Your machine is clean and ready to brew your favorite beverages. Getting rid of the scale buildup keeps the coffee taste pure and clear, so you will definitely enjoy your drink more after cleaning the coffee maker. Priming your Keurig machine can actually improve the quality of the coffee. 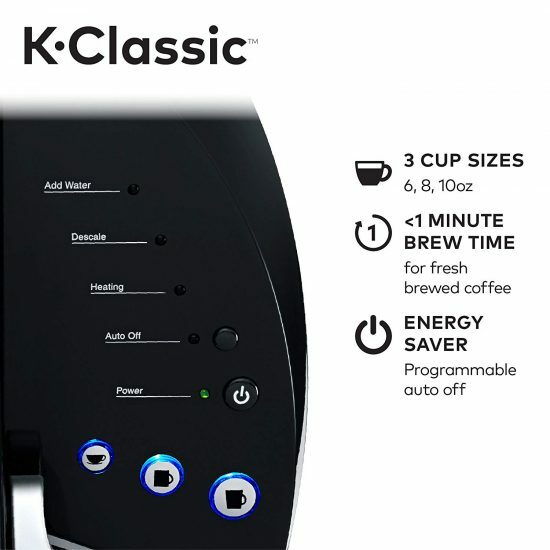 You just simply need to run one cycle without inserting the capsule (which means just brewing hot water). This will flash out the coffee residue from the previous beverages and heat up the machine contact points for a smoother operation. As a result, your drink will taste “cleaner” and fresher. Occasional reviews note that this model doesn’t always brew a full mug of coffee (may pour less water than needed). Obviously, the Keurig K55 is not a universal coffee maker. It cannot satisfy each and every user. However, this machine is perfect for certain people. Are tired of running to the coffee shop every day. One simple Keurig cannot satisfy every user, of course. So, if you still don’t know whether the K55 would be suited for you, let me help. Don’t want to buy K-cup pods all the time. So, do you think the K55 would be good for you and your coffee needs? Or are you planning to keep visiting your local coffee shop? Let us know in the comments down below!